Bradford City Council must be commended for continuing to put money into the arts and for several years now holding a music festival in Myrtle Park, Bingley. It’s a natural bowl shaped field, lined with mature trees and is a beautiful setting for some live music. The simple 2 stages event has been going for over 10 years now and during that time several great artists have played on those stages. 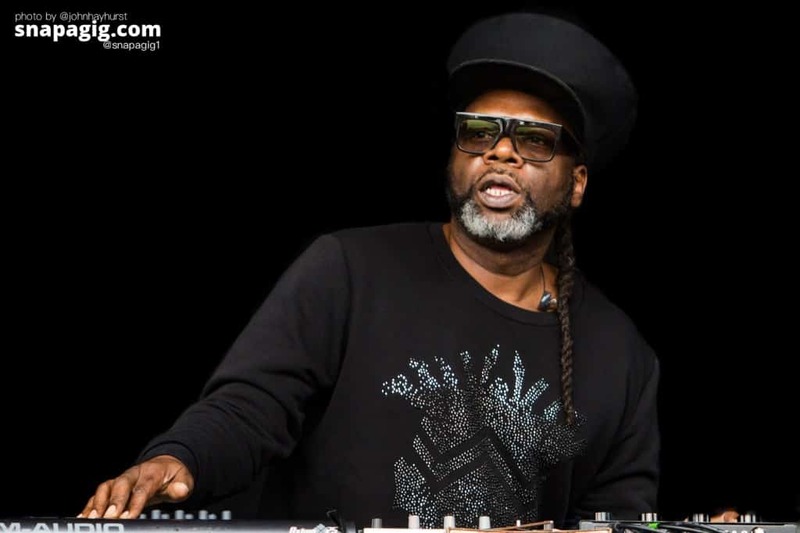 Bingley has always signalled the end of Festival Season as it comes after the August Bank Holiday and just before the kids go back to school – a final blowout and celebration for everyone. This year’s line up may have been less spectacular than previous years – most people I spoke to hadn’t even heard of The Wombats, and they were headlining the Sunday night, but with Kaiser Chiefs and Manic Street Preachers in your roster, that will guarantee a packed event and considering the more than reasonable ticket price of £70 for the whole weekend and only £35 for kids, there is no wonder that the whole family can attend. The demographic becomes a curious mixture of picnic parents with kids who want to relive some of their favourite bands, older music punters who get upset with the amount of under dressed teens who make far too much noise and get into fights, and then the said teens who are having the time of their lives at probably their first live music event without a parental chaperone. Testosterone filled boys in hoodies and teen girls thinking short shorts with your bum cheeks hanging out is a cool look are everywhere, and they are not particularly interested in the live music, more the DJ sounds in-between the bands. Friday opens with Cabbage, and whilst they seem a little lost now on the bigger stages and clearly don’t interact with the audience as much since that allegation of abuse case, they still put on some fierce political punk with Necroflat and Uber Capitalist Death Trade being the highlights. It’s a bit of a shock to the system for the families sat around on chairs and picnic blankets, but the young groups of students in their teens lap it up, they might not understand the words – but who cares, the sun is shining, your mate has smuggled in some vodka in a hand sanitiser bottle, and everyone is jumping around with a Haribo overdose. 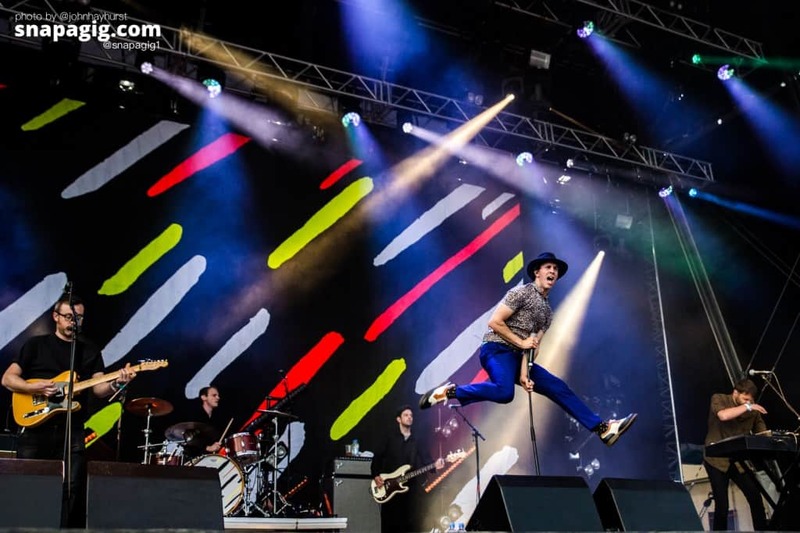 Scottish pop rock outfit Twin Atlantic were much more family friendly and then Maximo Park show what a great frontman Paul Smith is, he’s a constant buzz of energy wearing a hat and a wide-eyed stare. Going Missing and Girls Who Play Guitars are personal favourites but they motor through a 16 song setlist in an hour! 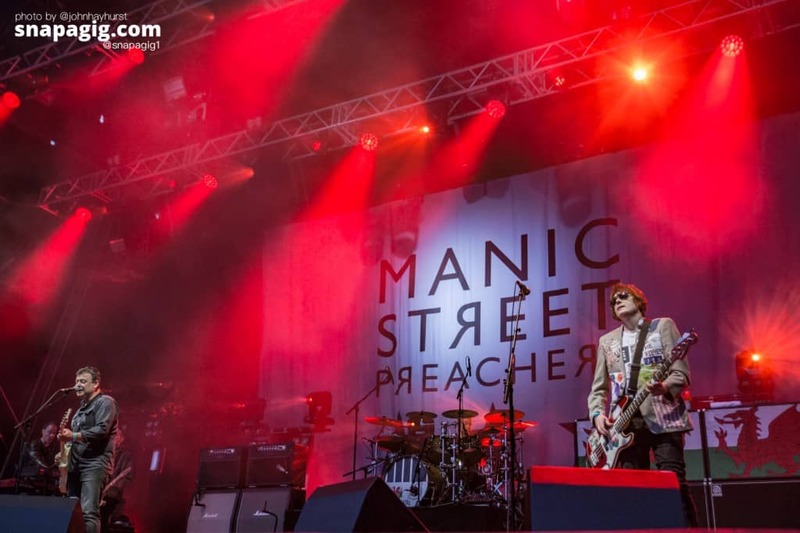 That nicely leads into the headliners Manic Street Preachers, can there be a safer headliner to a regional festival? Packing hit after hit in their set list and opening with a simple “Hello We are the Manic Street Preachers and this is Motorcycle Emptiness”, they follow that with Everything Must Go and Your Love Alone Is Not Enough. 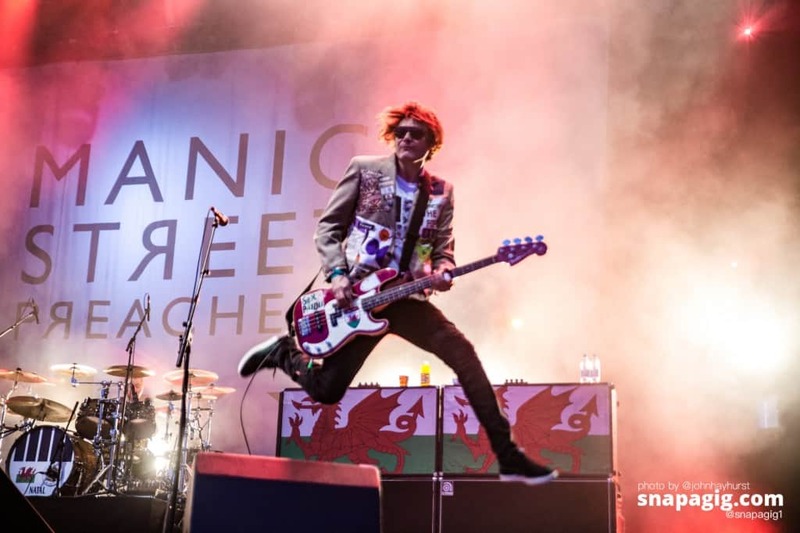 Nicky Wire still has a bounce in his stride and even James Dean Bradfield was seen moving much more around the stage tonight. 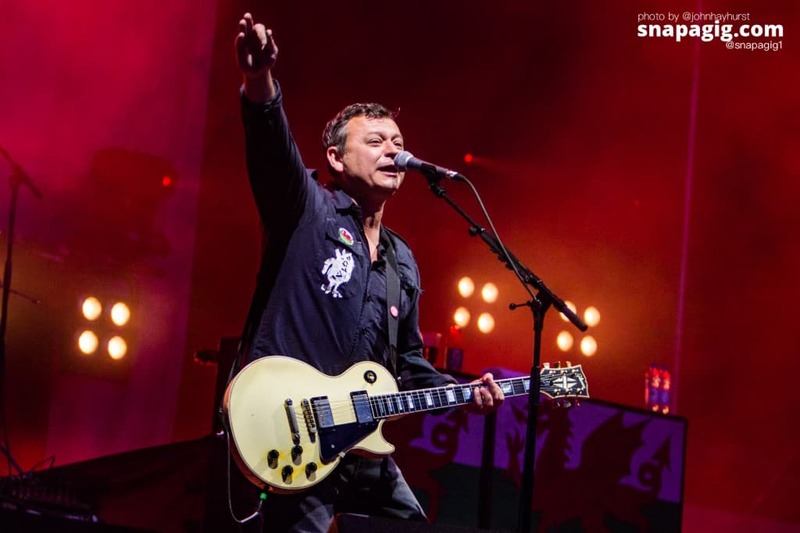 The Manics chalk up another incredibly professional festival performance and it is fair to say that they have slowed down and matured (haven’t we all) from their hundred miles an hour early punk performances to become the Welsh Institution of Indie Rock. 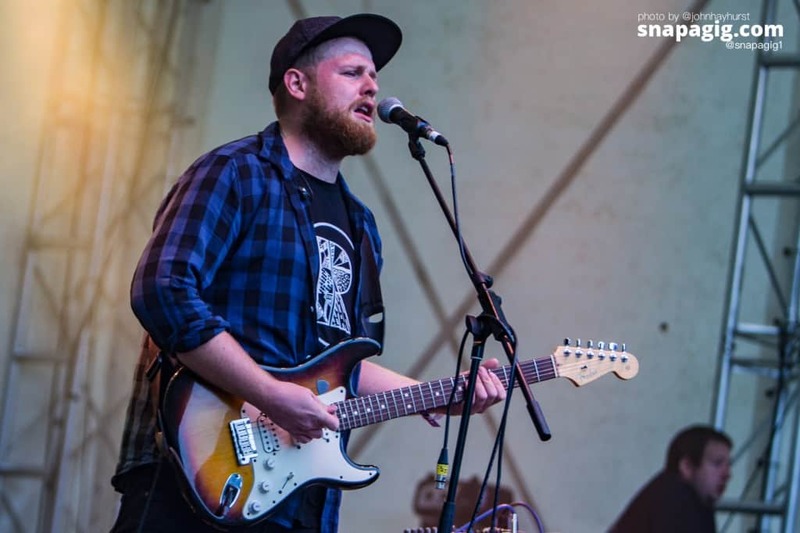 Bingley isn’t just about the main stage acts though and on the 2nd “Discovery” Stage you will find a mixture of local and national new artists, eager to play their new EP to those prepared to walk up the hill to the area. 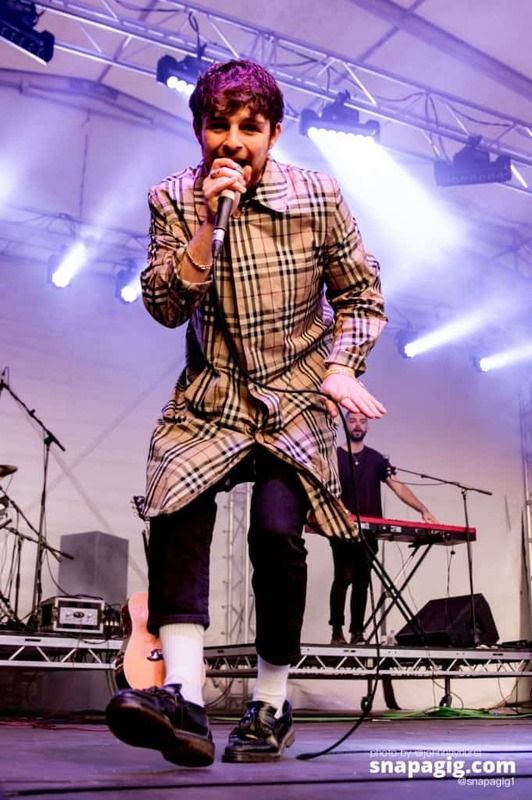 There was some incredible talent here to justify the ticket price tag alone, and tonight Tom Grennan really shone out from the pack with his raspy vocals, reminiscent of Paulo Nutini but with genre crossing styles of Soul, RnB and even a little reggae thrown in. He’s been compared to Jamie T but I don’t hear that harshness in his voice, it’s much more leaning towards a more soulful Jack Savoretti. Certainly justifying his headline slot tonight, and we expect to hear more about him in the future. Saturday was a hot sticky day throughout and packed full of some great stuff. 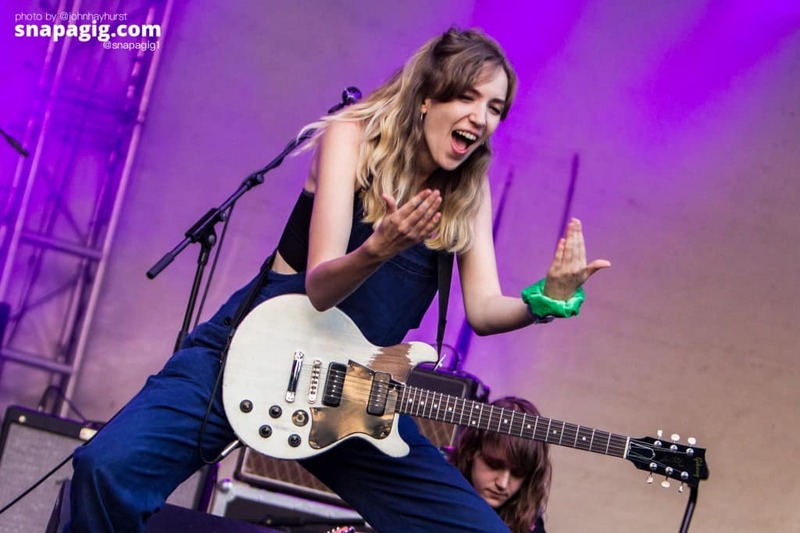 The Shimmer Band continue to become my favourite new outfit that I’ve discovered in the last few months and both Freedom and Shoot Me Baby are ready made for concert halls all over the UK – watch out as they are touring in October. 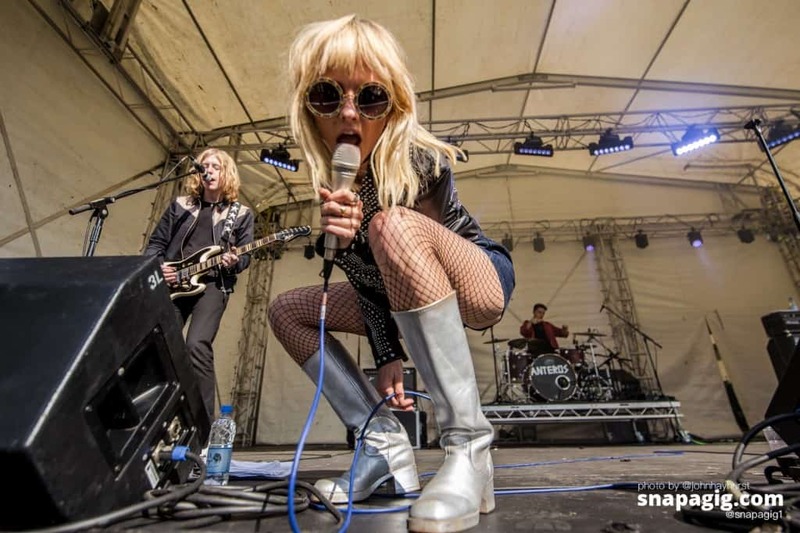 Similarly, Anteros are a pop rock act that should really be on the main stage, often compared to Blondie and it’s obvious why, Laura Hayden is a force to be reckoned with, she’s all blonde locks, long legs, boots, shades and attitude – Debbie Harry would kill to be this hot right now, and whilst their sound is a little more sugary than Harry’s post punk, it is very punchy nonetheless. The main stage is covered in leaves, twigs and owls, ready for British Sea Power, always underrated unfairly, never in fashion and yet have the most loyal fans around. 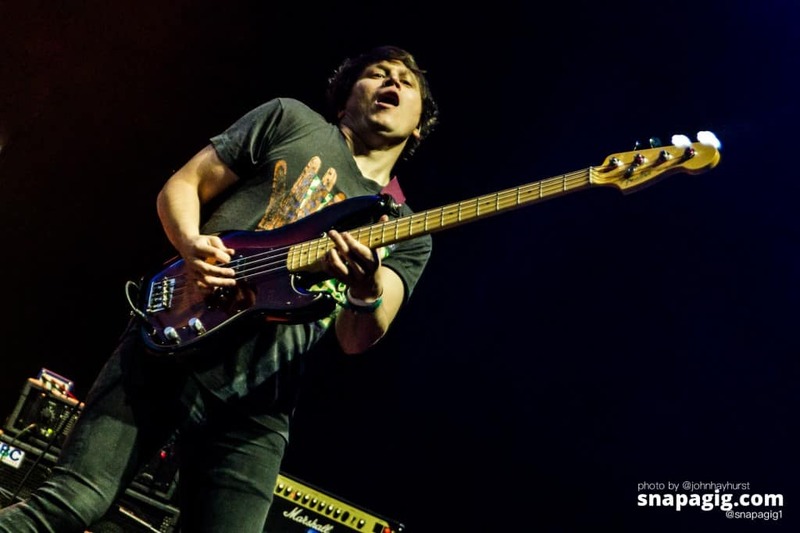 In a way, they are waiting for their Elbow moment to project them to the next level, it may never come and vocalist/guitarist Jan Scott Wilkinson may not care. 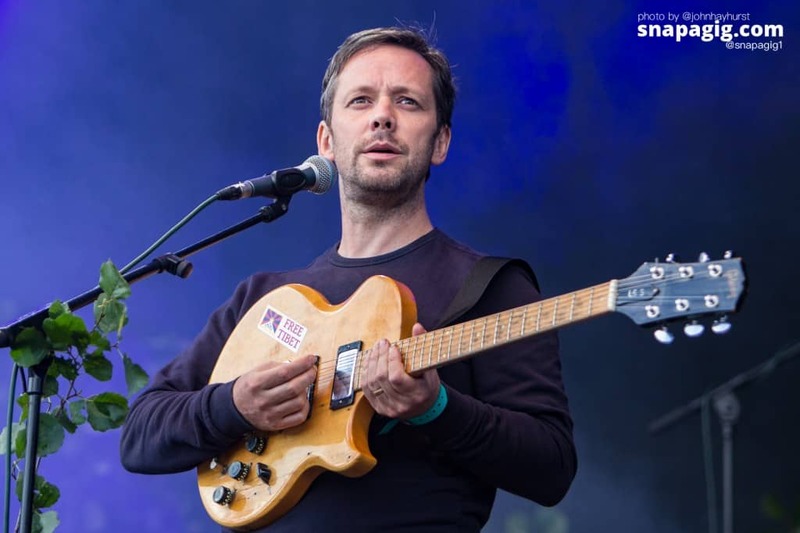 In the meantime, they continue to produce some stirring rock music for Bingley having already done the same at several regional festivals, including their birthplace home of Kendal this festival season. 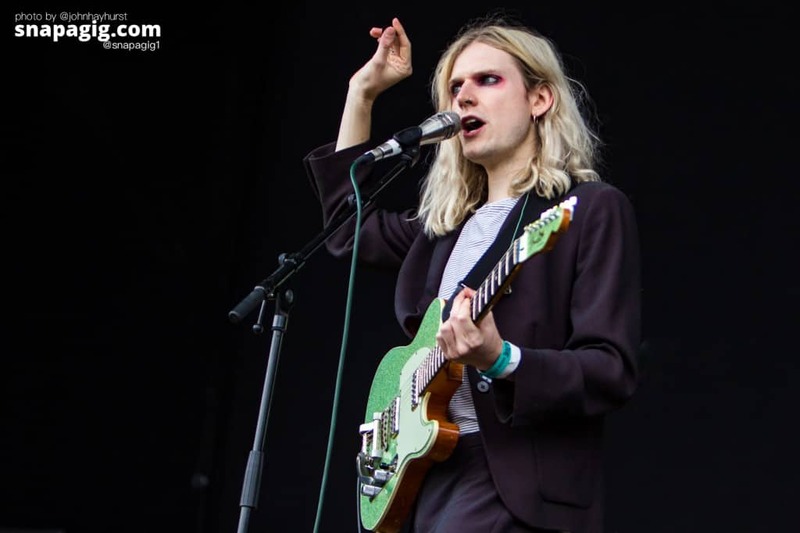 Following them were Sundara Karma the latest set of indie boy band hopefuls. They have more to offer though with the charisma of Oscar Pollock who looks a like a blonde Bolan, or a goth who shouldn’t really be out in the sun this early. Their songbook however is filled with fist pumping choruses that could genuinely lead the way in the next few years. That’s the beauty of this festival, it’s an introduction to the new, whilst carefully slotting in the established artist. 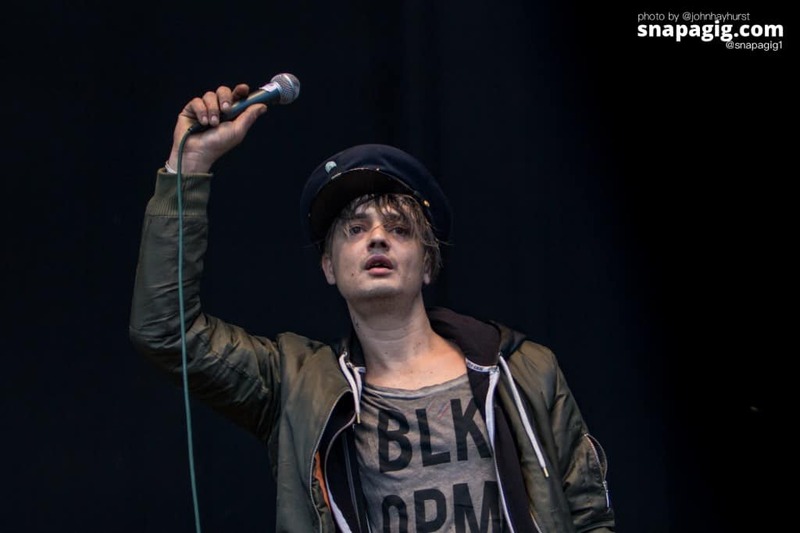 However, when you book Pete Doherty you are flirting with the unpredictable and sadly he was the low point over the three days. Looking like he had slept under a bush all week he stumbled on to the stage and immediately didn’t know what he was singing, stopping the 1st song midway due to a fight (we couldn’t see anything happening in the audience), incapable of putting the mic back in the stand he and the guitarist were in their own world for most of the time, the rest of his band looked on uncomfortably at the spectacle and seemed unsure where to join in. Time for a break and a visit to the many food stalls dotted around the place – the quality has drastically improved in the 10 years we have visited the festival. The bowling club (which is outside of the festival site) at the top of the hill was also doing a great trade in burgers and pints for a fiver, and I will admit now I was a frequent visitor! On the Discovery Stage we had the beautiful voice of Stevie Parker followed by the power pop band The Big Moon who gathered a good crowd and really got the dancing started, offering sweets out to the best dancers. Their album Love in the 4th Dimension has made it to the Mercury Music Prize nominations and they lead the way for an all-girl movement in popular music, it’s care free and fun, music with a smile on their faces, band and audience just having a great time – what’s not to like. 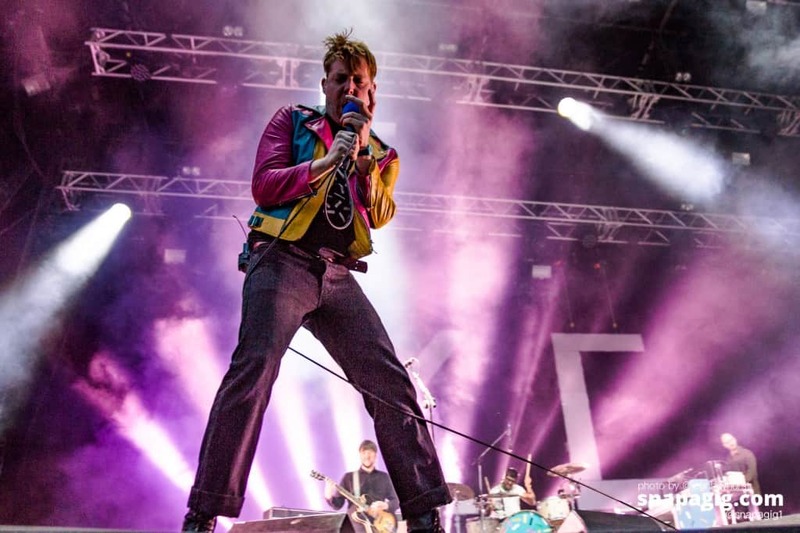 Headliners for Saturday are Kaiser Chiefs and if you want a lesson in how to be a frontman – Ricky Wilson gave a masterclass tonight. Away from his TV celebrity status he remains an entertainer on stage and whilst some of the tunes could be argued as similar (nearly all have a wooooooooaaaggghhh in there somewhere), it is everything that this crowd needs tonight having had the dirge of Doherty for the last hour. Continually bouncing around the stage Wilson commands everything around him and even jokes at the early leavers running for the car park to avoid the traffic. They play Oh My God and the line “I’ve never been so far away from home” Wilson says “the irony is I was born 2 miles away from this site in Keighley, I’ve never actually been so close to my original home”. Sunday morning was a late start – I’m blaming the partying the night before and too much rhubarb and strawberry cider at the bowling club. 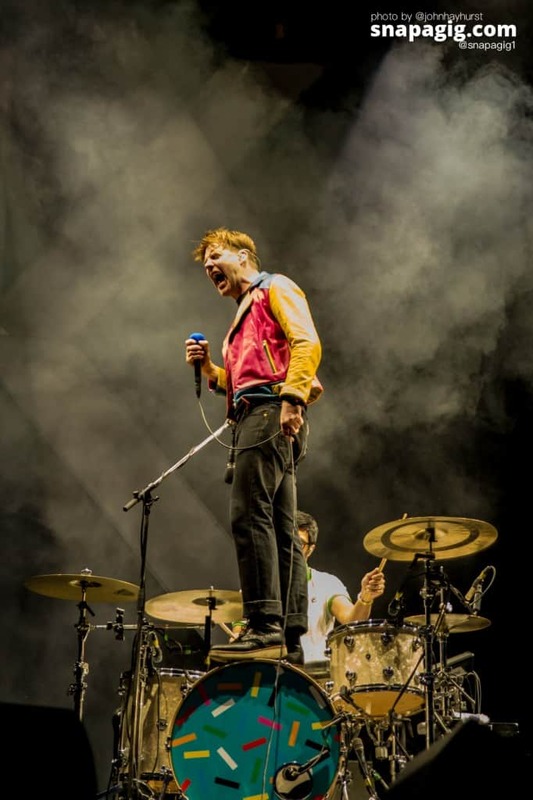 On the Discovery Stage Marsicans were showing off their 80’s inspired colourful smiley pop and Tom Walker followed with a deep gravel soulful vocal that Rag’n‘Bone Man would be proud of. 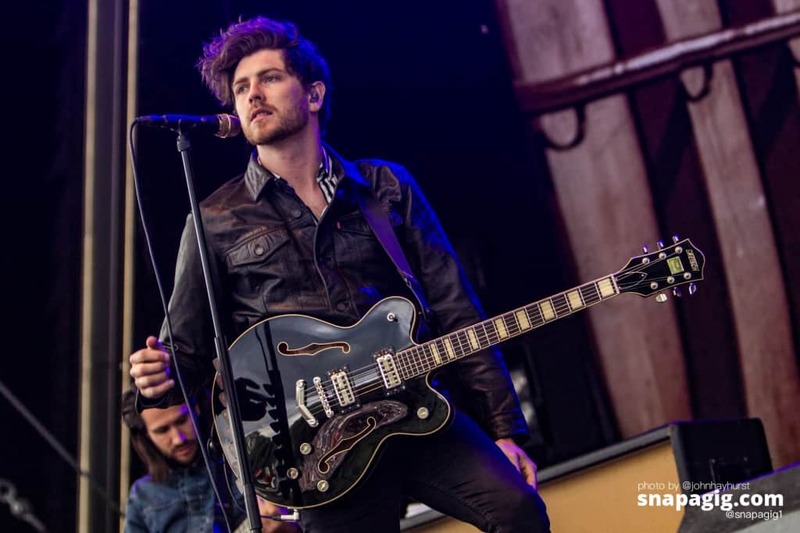 He’s another person on that stage that has shown bigger credentials than expected early in the day, and if only we could hear his guitar I’m sure he cuts a fine riff and solo too. Meanwhile on the Main Stage Badly Drawn Boy is solo and mostly acoustic with occasional piano. 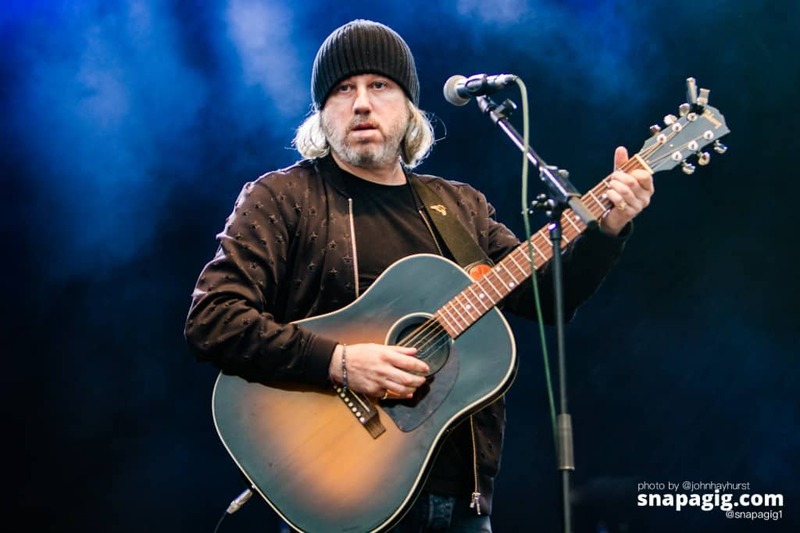 It’s been a quiet morning and noticeable that more people appeared around 3pm – perhaps they were suffering too, but more likely that Badly Drawn Boy was the first act listed on the bill that they recognised. 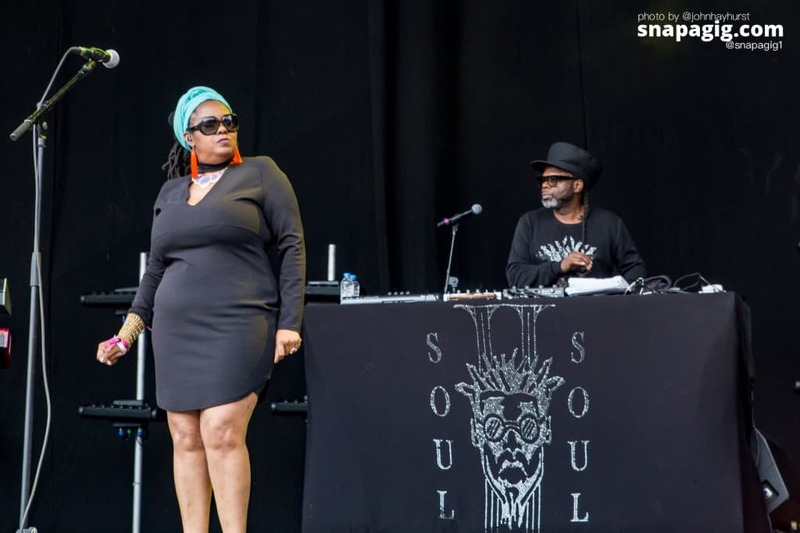 Either way it was completely packed for Soul II Soul and rightly so as Jazzie B (real name Trevor) and Caron Wheeler opened proceedings with Keep on Movin’ which went on for some 8 minutes. For some punters this was the band that lifted the day even though it started to rain, and Back to Life was almost a mantra for all those kids who would next week be going back to school. A theme tune for the end of festival season and the summer “Back to Life, Back to Reality”. 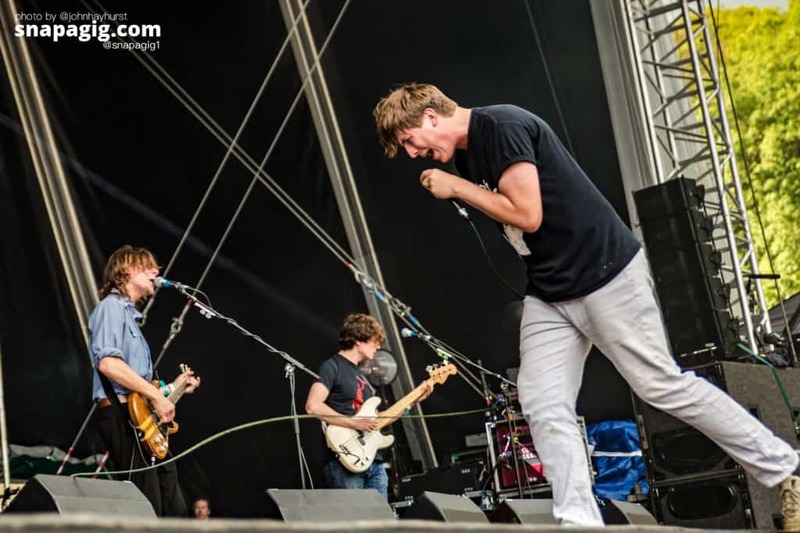 Another great new band were on the Discovery Stage in the afternoon, crossing indie with some pop punk Get Inuit are probably the best tonic going right now. 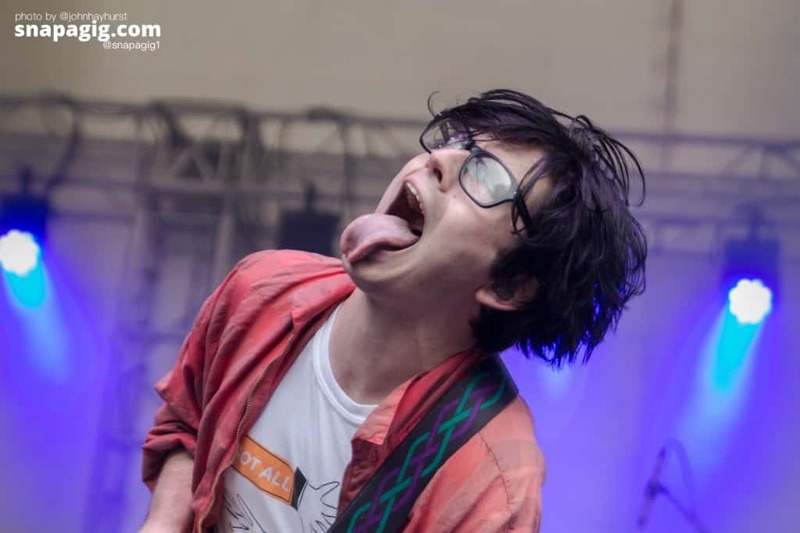 Lead singer and guitarist Jamie Glass is a constant head shaker and leg kicker – reminding me of Rivers Cuomo from Weezer, but maybe it’s just the glasses. 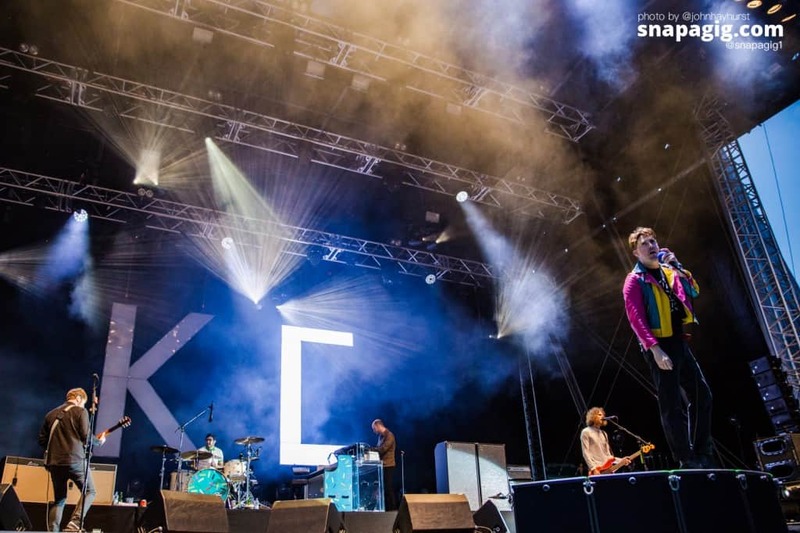 Great energy and a fresh sound from them, and then back for Feeder on the main stage, a wicked ‘one two’ of quality bands, the new and the experienced. 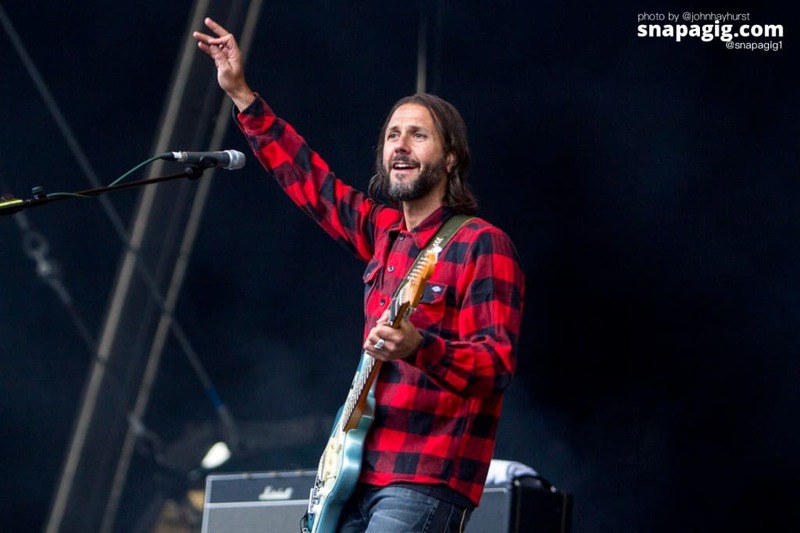 Feeder have a wealth of songs you already know but don’t realise it, Grant Nicholas is a little more laid back these days in his checked shirt whereas bass player Taka Hirose is dressed to the nines and pumped up to the extreme. Buck Rogers and Seven Days in the Sun are always highlights from their set and the crowd lapped it all up making you wonder whether they should really be headlining tonight rather than the Wombats. Feeder play for an extra 15 minutes and that is partly due to the Wombats needing to borrow some of their equipment as theirs is still at Heathrow Airport! But before the headliner on the main stage it’s back to Discovery one last time for The Orielles who are a brilliant jangly shambles. 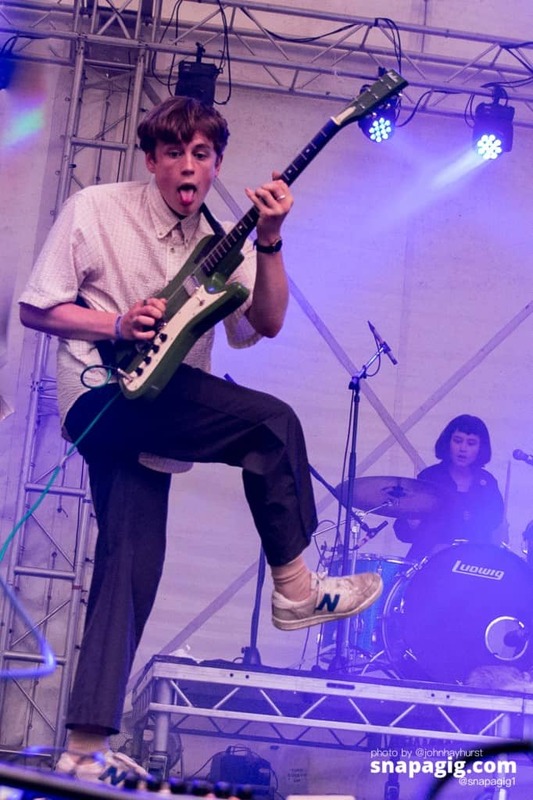 A 3 piece from not too far away in Halifax, still so young – Esme and Henry are still in their teens and they have done the whole met at a party, started a band and created their own scene – DIY style. Love the fact that Henry had to have a band meeting to check the next song on the list before disappearing back into his own head down shaking world. A superb ending to a great festival stage over the weekend. 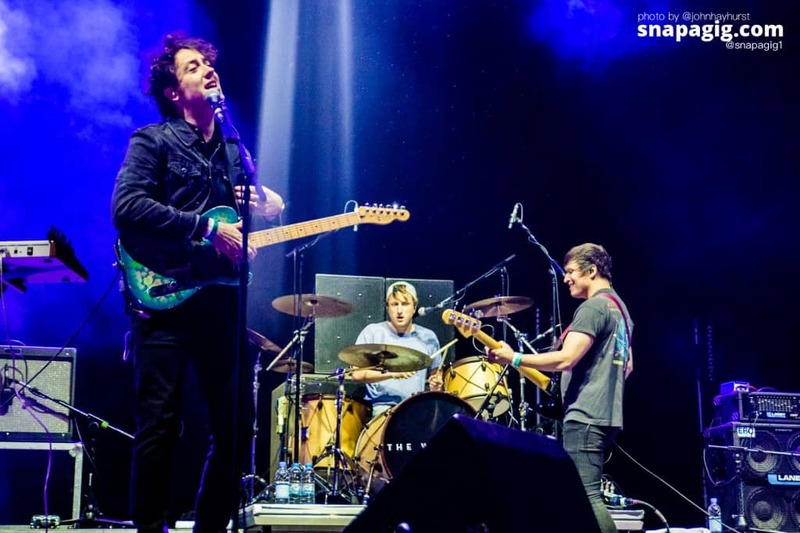 The Wombats surprise everyone with a rousing hour of most of their debut album A Guide to Love, Loss and Desperation and similar to Feeder people are surprised that they actually do know quite a few of their songs. Kill the Director is the first after they apologise to everyone that they have mistakenly left some of their equipment in London, particularly keyboards that produce slightly different sounds than the band are expecting, but their experience gets them through it all and let’s face it – no one in Bingley probably realised anyway. I don’t believe bass player Tord Overland Knudsen stood still for any of the performance as he constantly ran up and down the stage. Let’s Dance to Joy Division is still their biggest hit even though it is over ten years old now and that led into the huge fireworks finale. 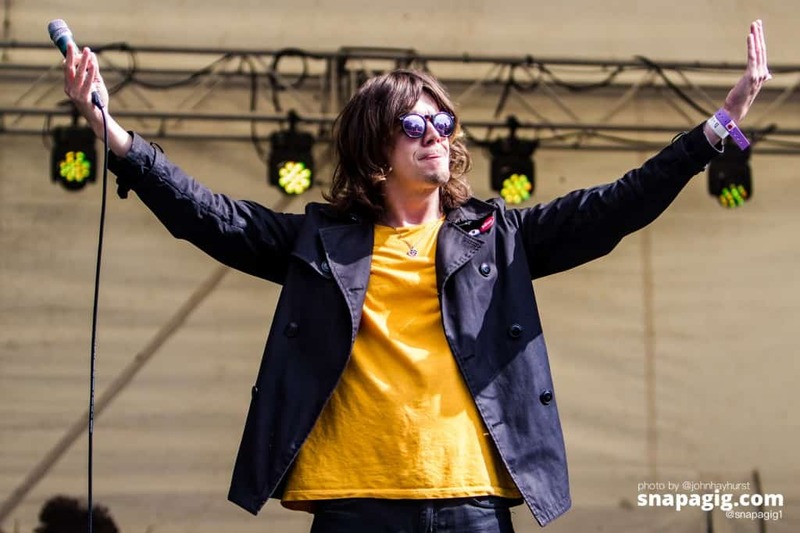 Bingley Music Live has managed to stage yet another 2.5 days of great music on 2 stages and at a ridiculous price of £70 a ticket, that’s a huge achievement and real credit to Bradford Council for continuing to support it all. Even though there were a few technical hitches and a security team that had a mind of their own sometimes. We had a great time here, and will be back if they can organise the same in 2018.